Donald Trump’s campaign has undergone some major reshuffling in the past few weeks, and his latest staff shake-up proves that his troubles are far from over. Early this morning, the Trump campaign announced that it’s fired the man in charge of explaining what Donald Trump is to gorillas, with no official word yet on who his replacement will be. Yikes. Things are not looking good for Donald. Trump’s gorilla outreach has been a part of his campaign since day one, but the program’s fledgling results have left many wondering about the fate of its leader, longtime Trump family ally Jeff Hawkins. Hawkins’ role in the campaign was to build awareness of Donald Trump among gorillas by positioning him as a good, strong alpha male who is skilled at crushing things. But like so much of Trump’s campaign, this expensive initiative couldn’t get out of its own way. While Hawkins has spent tireless hours trying to increase Trump’s recognizability within the primate community, it simply hasn’t been enough. 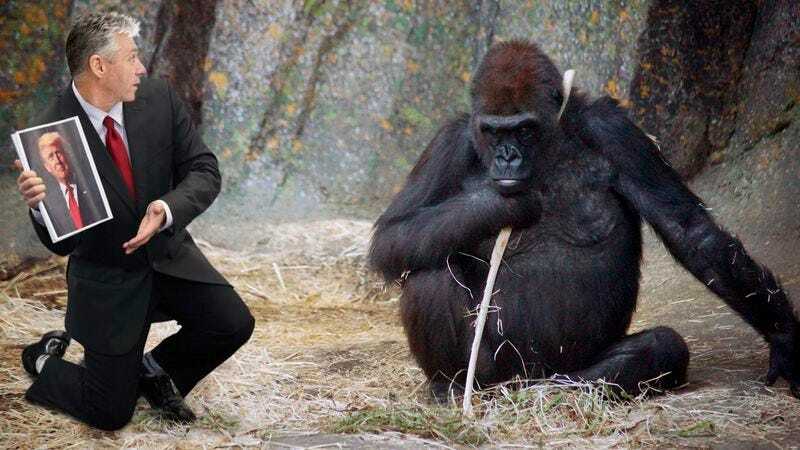 After nearly $15 million spent on the project, less than 40 percent of gorillas in American zoos were able to look at a picture of Trump and point to a hammer, as Hawkins had promised all great apes would be able to do by June. After it was made public that even fewer gorillas were able to sign “Rage King” after watching a clip of one of Trump’s speeches, Hawkins’ fate was sealed. The campaign is now taking drastic measures to get back on track. While the campaign has yet to formally announce who Hawkins’ replacement will be, all signs point to Trump’s former business partner, Liam Wetherton. Wetherton was recently spotted heading into the Bronx Zoo with a 8” x 10” portrait of the Republican presidential nominee, a book of sign language, and a big red ball. It’s not clear how the campaign’s gorilla strategy will evolve under Wetherton’s famously aggressive leadership. But with such disappointing numbers so far, he’s got a lot of work to do before gorillas know to build a throne out of rocks and sticks when a life-sized Trump mannequin is placed in their pen. Trump’s campaign has been a tumultuous one, and a high-profile firing like this one proves that there’s still plenty of trouble brewing behind the scenes. Donald’s got a long road ahead if he wants to win the White House, and an even longer road if he wants gorillas to know about him before he gets there. We’ll just have to wait and see if this latest shake-up can steer his campaign in a better direction.